William Morrow Paperbacks, 9780062293190, 496pp. Leiyin’s three souls manifest three very distinct and different personalities. What do you think the souls represent, individually and collectively? What do you think their role is in the story? Pre–World War II China was a time of great turmoil. What details and descriptions of ordinary life does the author use to evoke the social and political transitions taking place? Think about the conflicts that women of Leiyin’s generation experienced during this time of transition. How are they similar to the experiences of immigrant women today? How are they different? 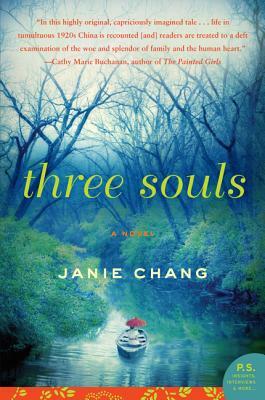 Three Souls makes a strong statement about how women were treated in Chinese society. Of all the examples showing how women were oppressed, which affected you the most, and why? What new information did you learn about Chinese history, society, or family dynamics? Were there any passages or scenes in the novel that you felt gave you fresh insights into that time and place? In Leiyin’s memories of her times with Hanchin, what tips us off that he is just toying with her? Discuss what Leiyin doesn’t see or won’t acknowledge that she sees. Throughout Part One, Leiyin is warned repeatedly to obey her father. What do we know about her father that might cause her to believe he will eventually give in to her or at least forgive her? Many readers consider Stepmother the most interesting secondary character of the novel. Do you agree? What makes her so memorable and admirable— especially given the constraints of the era and her status in the family? The female characters are not the only ones whose lives are constrained. Discuss how some of the male characters are also trapped by tradition. In many ways this is a coming-of- age story—in which the final coming of age happens after the protagonist dies. In each of the three parts of the novel, how does Leiyin grow and mature? What does she learn about herself or the way the world works? Consider the structure of the novel. The author changes between past tense and present tense. Do you feel this is confusing or effective?